Mark Sedon, Leo Houlding and Jean Burgun were 18 days into a 10-week Antarctic expedition which had been dubbed "the most audacious and potentially groundbreaking polar expedition in a generation" when Mark received the radio call they'd all been dreading. The trio were just a kilometre from Mt Spectre - a 2020-metre-high granite peak in the most remote mountain range on Earth that they had set themselves the task of climbing - when the radio crackled into life and Leo's panic-stricken voice pleaded "my pulk has fallen in a crevasse and is pulling me toward it. Help!". The three men were each towing a pulk (sled) weighing between 160 and 180 kilograms; dead weights they could only hope wouldn't run them over if they crashed while kite skiing or plunge into one of the many crevassed that marked the terrain, dragging them down with it. 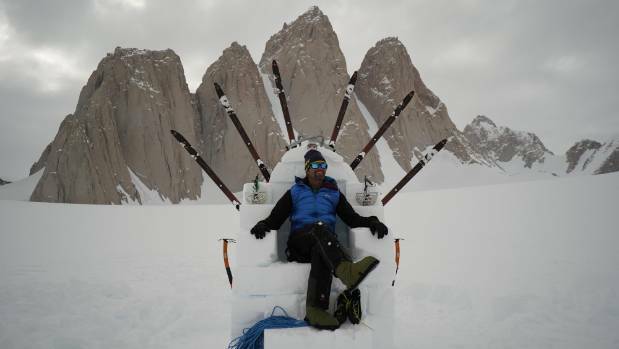 King of the mountain: Mark on a throne of snow and ice in front of Antarctica's Organ Pipe Mountains. Mark, the sole Kiwi in the group, had suggested they tie knots in the ropes attached to their pulks to help them out if the latter happened and fortunately Leo's had caught on the edge of the crevasse, preventing it from tumbling to the bottom. Luckily, Jean wasn't far behind and wasted no time in securing Leo before abseiling into the crevasse and emptying the pulk so that it could be pulled back up, freeing Leo. 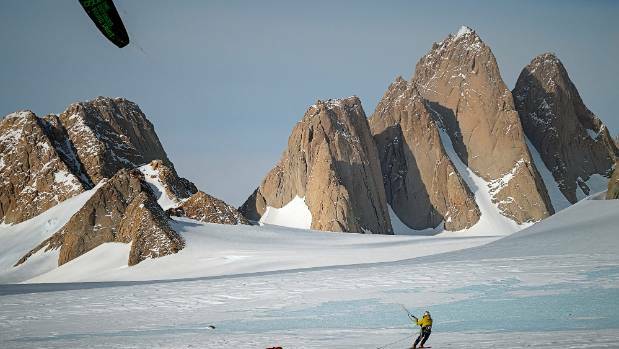 While Mark, a 48-year-old heli-ski guide from Lake Hawea, says this was the closest any of them came to death their 1700-kilometre kite skiing and climbing adventure, he says he felt afraid or unsafe most days. Which is hardly surprising really. 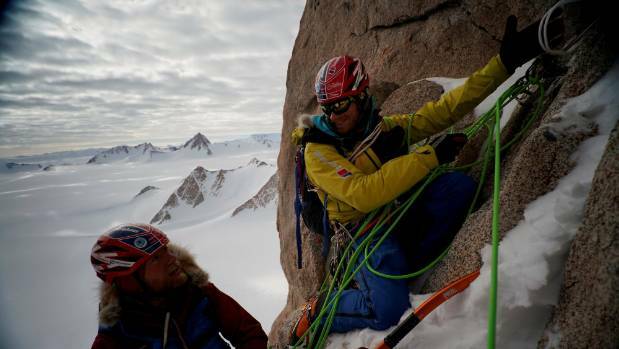 Team leader Houlding, a renowned British climber, described the continental crossing in an interview with the Financial Times before setting out as "21st century exploration at the edge of the impossible". 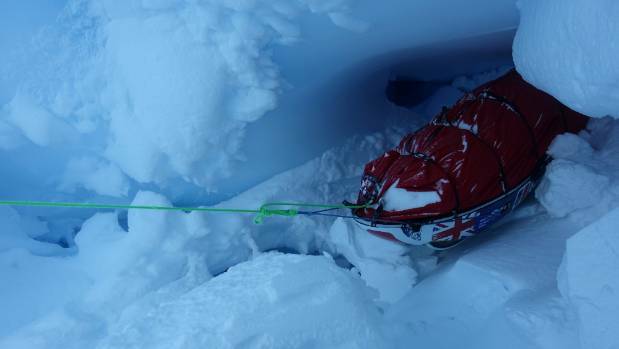 Leo's pulk being lifted out of the crevasse that threatened to claim it. And he wasn't just talking it up. 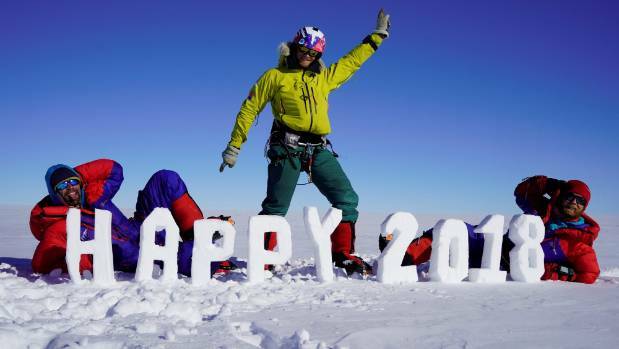 Sir Chris Bonington, the UK's best known mountaineer, told the publication, which described the trip as "the most audacious and potentially groundbreaking polar expedition" in a generation, "Make no mistake, it is a hell of a thing they are undertaking. There are lots of incredibly supported journeys being done in Antarctica now, but this is very, very different to what has gone before." Advances in kite skiing technology have, Mark says, made it possible for Antarctic explorers to cover about 10 times more ground in a day than man hauling [walking on skis, towing a sled], enabling them to venture further into the world's last great wilderness. Mark, who has been skiing for 33 years and kite surfing for 15, was a last-minute addition to the team. Leo was in New Zealand to speak at the Mountain Film Festival, which Mark runs with his wife Jo, when a mate who had planned to join he and Jean pulled out. Mark was a last-minute addition to the team and had just two weeks to train. "[Leo] hung up and turned to me and said "How am I ever going to find someone who can kite, ski and climb, has Antarctic experience, can film and take photos and has medical and electronic experience?". I replied instantly with "I can!...I had two weeks to train after I finished my winter heli-ski work." Having chased winters around the globe since he was 21 and been to Antarctica several times before, Mark was eager to put the climbing, skiing and kitesurfing and survival skills he's amassed to the ultimate test in the name of "a real adventure". 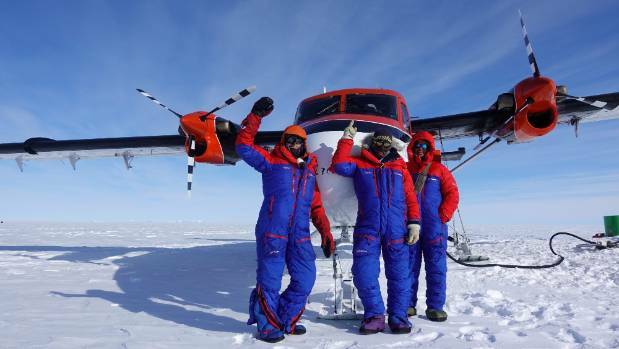 The trio flew on a chartered Russian Ilusion Jet from Chile to Union Glacier in Antarctica's Ellsworth Mountains and then a smaller aircraft to just before what is known in aviation circles as "the point of no return" (the point at which a plane would lack the fuel to fly back to its starting point). Refuelling at the most remote fuel station in the world. Landing on bumpy snow in the Polar Plateau last November, Mark wondered whether this whole adventure of a lifetime caper was such a good idea after all. 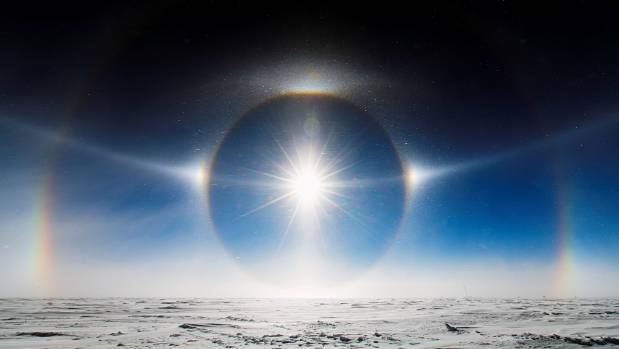 "It was minus 35 degrees at the drop off point near the South Pole. I almost turned around and got back on the plane! It was very intimidating, beautiful and also extremely exciting to be at that point." Leo and Jean, a Frenchman, had raised US$350,000 over two years to fund the expedition. If they'd had an extra US$100,000, they could have flown directly to Mt Spectre but, as it was, they had what they thought was an eight-day journey ahead of them. Instead, they suffered through 18 days of what they came to refer to as "Spectre spankings". Jean arriving at the Spectre. "Every day we battled our way closer, fought for every kilometre... The route finding was difficult as no one had gone that way. The weather was difficult, so was the cold." A four-day storm which brought gusts of 40 knots an hour and saw temperatures plummet to nearly minus 60 degrees celsius delayed their start but they took the opportunity to shoot footage for the film they were making of their trip. When the winds eased to between 20 and 25 knots on day five, they decided to give kiting a crack and ended up making up so much lost ground that they kept going for about four hours, taking care to dodge the wave-like ridges (sastrugi) which could have overturned their pulks if hit at the wrong angle. Jean, Mark and Leo with the "Sastrugi man". From then on, they kept moving as much as possible, partly to keep warm. With winds about twice as strong as they had expected, frostbite was a constant concern. It was so cold they could feel the moisture in their eyes freezing between blinks. Even with ski boots stuffed with super-warm liners and neoprone overshoes didn't prevent their feet from going numb. On one morning Jean had to lay his bare feet on Mark's bare stomach for half an hour before he could feel them again. Still, it was fairly smooth kiting until day eight, when they veered off route and into an icefall. Similar to a frozen waterfall, icefalls are formed when a glacier flows over a steep drop, creating a highly crevassed downhill surface. Being overpowered on a kite makes it very hard to stop and Mark came over a bulge to find Leo's pulk had flipped and Jean was struggling to reright it, in danger of being dragged down the icefall by his own. Mark (left), Jean (centre) and Leo welcoming in the new year. Luckily disaster was diverted and they decided to ski down the rest of the icefall but, with their pulks still threatening to drag them down, it was far from easy going. Confronted by slippery blue ice and gaping crevasses at the bottom, they kept on for another two hours before they found a snowy spot to camp on until the wind died down. When it finally did, two days later, Mark says they had their first enjoyable kiting experience of the trip, coasting across the smooth, powdery Californian Plateau. After a few hours, however, they were back on uneven ground. When Mark dragged his pulk over to a likely looking camping spot and a crevasse bridge collapsed, they decided to rope themselves together and walk to the next suitable kite skiing spot, which ended up taking six hours. 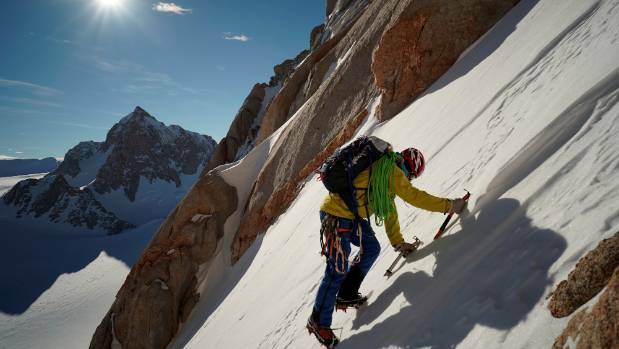 After rescuing Leo's pulk from the crevasse on day 18, they spent a few days exploring before attempting an unclimbed line of Mt Spectre's north face. The mountain, in the ultra-remote Gothics range, had been climbed only once before, by the late US mountaineer Mugs Stump and his geologist brother Ed. Leo (left) and Jean at a hanging below stance during the climb. 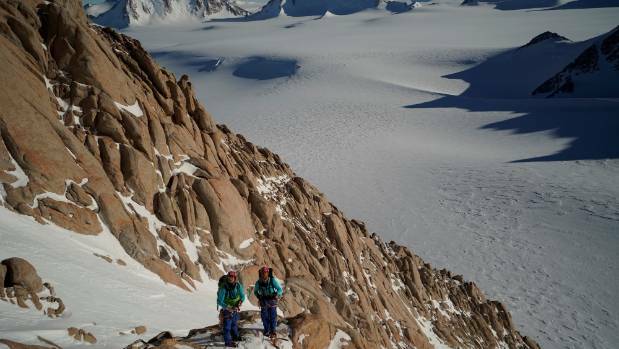 Mark describes their 15-hour ascent as "extremely hard climbing" through snow, ice and worsening weather. It was 11pm by the time they reached the summit under the "midnight sun", took a few photos and made a hasty retreat back to camp, arriving at about 5am, 21 hours after setting off. 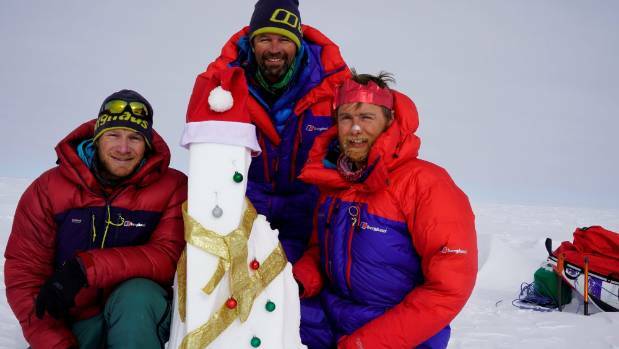 They made it just in time because a storm blew only half an hour later, with winds so strong Mark says withstanding them on the mountain would have required "an epic survival effort". The next week was a frustrating one. Surrounded by mountains that had never been climbed before, they were desperate to give them a go but, with winds remaining high and the weather unsettled, they were only able to summit one more peak before it was time to head back to Union Glacier. Jean climbs the ‘easy’ snow couloir on the Spectre. Mark says they were worried about how hard the 1400-kilometre journey back would be "but it went well and we did it with two weeks to spare". To lesser mortals it sounds like a superhuman feat of endurance. They intended to spend 20 days man hauling across the heavily crevassed Fox Glacier. Fortunately, the terrain smoothed out on day five, allowing them to launch their kites and cover more than three times the distance they would have on foot. From then on, they were able to kite ski regularly, often covering 100 kilometres or more in a day. "We managed a few days of over 200km, which was a highlight for me, especially on soft, silent powder snow," Mark says. His love of kite skiing is such that, while the weather was usually bad, just "a few perfect days or hours" were enough to make him feel transcendent. Physically, Mark says he had "hard days and harder days". He broke his back in three places in a helicopter crash four years ago and says it gave him "some trouble" on the trip, but he managed "okay". "Every part of my body hurt some days but overnight we'd rest and by morning, I'd be mostly okay again." 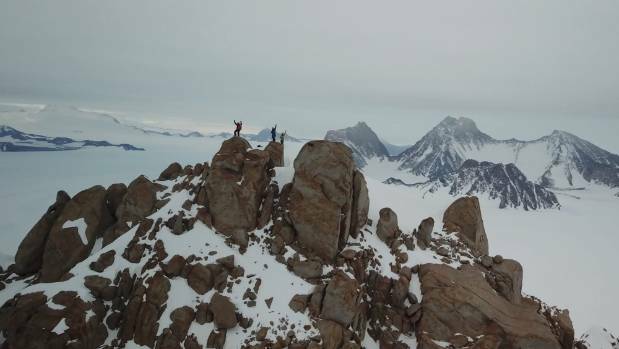 The trio carried a drone up the mountain to get a unique summit shot. 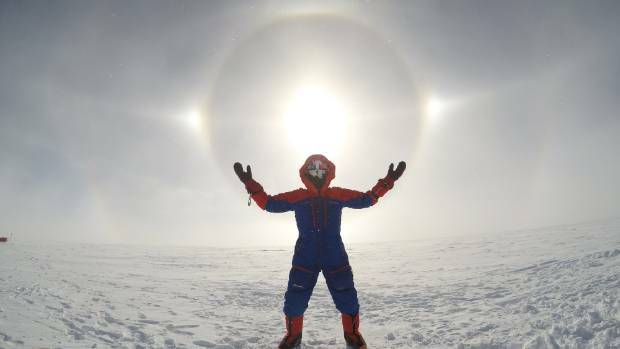 It was on the homeward journey that the trio witnessed one of the most incredible natural phenomena Mark says he has ever seen: a circular apparition in the sky with the sun at its centre and rainbows on its rim. That night, the wind came up at 10pm just as they were getting into their sleeping bags so they decided to pack up and kited through the night under the sci-fi like spectacle - which Marks explains was a mixture of a solar corona, 22 degree halo, solar flare, sun dogs and a parhelic circle - for more than 100 kilometres. 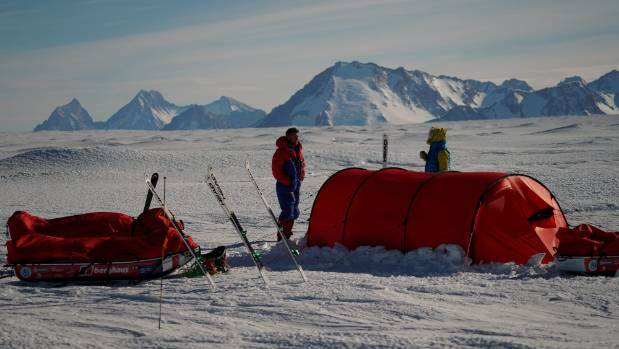 Arriving back at Union Glacier in January, just in time for the buffet dinner they'd been dreaming of, Mark says they sat back, relaxed and took proper stock of how much they had endured. The most phenomenal natural phenomena Mark says he's seen in his life. While he says not one day of the 50 was easy, he loved every minute and is already planning his next adventure. "When I look at images and video, I often have to remind myself that I was really there! Sadly the memory is already fading. 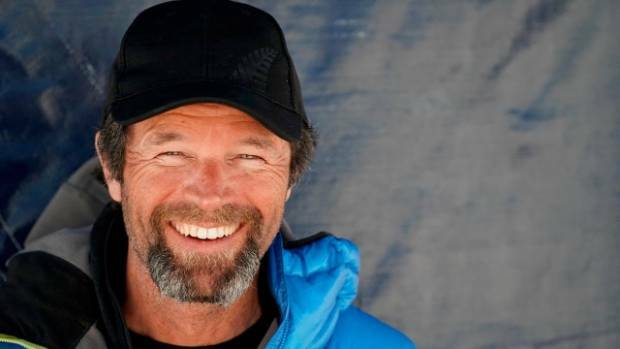 But doing slideshows and motivational talks [he is speaking about his adventure at this year's Mountain Film Festival on July 3 in Wanaka and July 7 in Queenstown] really help to bring it back, and by taking other people on the journey, I get to relive it too." The amazing mix of solar corona, 22 degree halo, solar flare, sun dogs and parhelic circle. Camping among the crevasses on Scott Glacier. 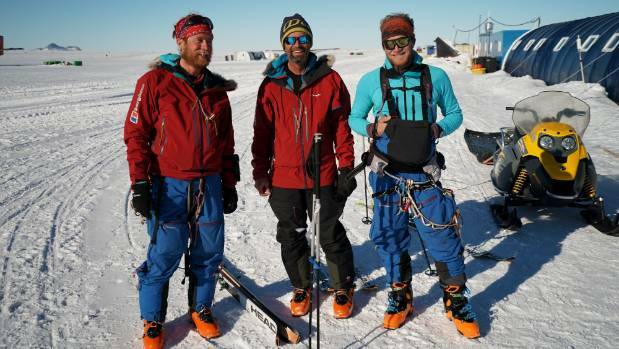 Leo (left), Mark (centre) and Jean back at Union Glacier after 55 days without a shower.